Woodturning Ideas and Tips made simple for you! The woodturning ideas and tips that I am sharing here come from my years of experience. I am self taught, have never taken a class or read a book on turning. I did look at a video on how to get started once, but I soon found that each turner has his or her own method of turning. Let my tips simply be a guide, but I encourage you to experiment and find your own wood turning techniques. My friends, family and woodturning buddies will tell you that I am a perfectionist. I enjoy the challenge of starting with a woodturning blank not knowing what you will find inside and creating a thing of beauty. This includes every knot, groove, line and even hole found naturally in the wood, giving it character and originality. Most all turners and most all articles that you read will suggest or tell you to make up your mind about a design and stick with it. I usually let the piece of wood guide me to the shape and design utilizing the natural wood characteristics. We provide a variety of blanks so that you may create a vast selection of turning projects. I hope that you enjoy reading the articles and seeing some of the ways in which the woodturning blanks can be created into different forms and woodturning projects. Click on the links below to read your favorite article. Inlay work adds excitement to your woodturning projects. Coring bowl blanks, read how to save money and wood. Read our helpful tips on turning Norfolk Island Pine. Explore the ease and fun of turning green wood. 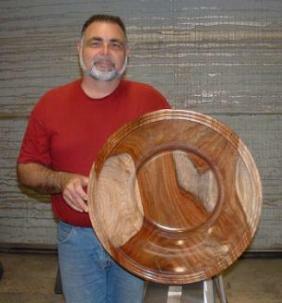 Return from Woodturning Ideas and Tips to Woodturning Blanks 4 U home page.